Stainless steel is used for aggressive and corrosive media. The material is durable and strong. 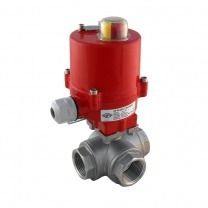 3-way electrical ball valves are resistant to high pressures, temperatures and abrasion. They are used in a lot of high pressure applications in for example industrial or petroleum sectors.